Some of you may have alrerady heard, but for those who didn't, or didn't get the full story at Baltimore, I'll recap. On Sunday morning, after having breakfast at the hotel in Baltimore, I headed over to the convention to setup. Once I got to my table I felt very itchy and hot. I couldn't stop rubbing my eye and my palms itched terribly. I headed to the bathroom to splash some water on my face, and found that as I walked my hands were swelling. Once in the bathroom, I didn't really recognize the guy looking back at me in the mirror because my face was swelling so badly. Julia took me to the E.R. where it was established that I must have had an allergic reaction to food (though I have never had any food allergy in my life). My swelling was starting to effect my tongue and throat so that it could have been possible that I would have become unable to breathe. I was kept at the E.R. for about 5 hours total for medicine and observation. I was able to get back to the convention and sign some books, but because my hands were still a bit swollen, I wasn't able to do any sketches. I want to apologize to the fans who I told to stop by Sunday for sketches and the fans who came by for signatures. I really wouldn't ditch a con unless I had good reason. I think the people who helped watch my table Sunday (Emily Jenkins, Jeremy Bastian, and Nick Tapalansky) were cautious to reveal the personal nature of my absence, but I want everyone to know I was in the E.R., not simply sleeping one off or being lazy. A big thanks to Emily who did the lion's share of the table sitting for me. She not only managed to keep the books available to fans, but also got all my finished commissions to their owners and made a few page sales!! Also thanks goes out to Dr. Kim and Dr. Rice and the staff at University of Maryland Medical center for their help. I have an appointment tomorrow to start testing for what may have cause my reaction (so far being guessed as a raw-fish-cross contamination). Because of these health problems and Mid-Ohio next weekend, I may be slow or unable to respond to e-mails and blog comments, but please be patient and I'll try and catch up when I can. Other than the allergic reaction, Baltimore was great!!! I really like this show a great deal. Marc Nathan does a great job making it feel like a home-town convention, with a big budget guest list and staff. I was worried that because the Diamond retailer summit that usually is linked to the con, was in Vegas this year, Baltimore attendance would be down. I don't know what the official count was, but by my estimation, it was up from last year! 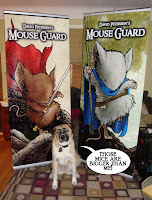 Thanks to Devyn of imphotographics.com for dropping off my new convention banners in Baltimore. Space was a little tight so I was only able to show off one of them at Baltimore, but thought I'd take photos of how great I think they turned out. 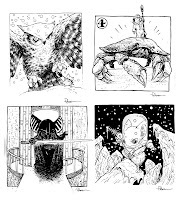 I have three pieces of artwork to share this time. The first is from Jackie Santiago. She was set up with Nick Tapalansky in artist's alley at Baltimore. This was her first time with an artist alley table. She says she did very well and picked up a great deal of commissions. Next up is another piece I received in Baltimore, but unfortunately, I don't remember the artist's name and I cannot read the signature (it's a tiny drawing, smaller than a business card). 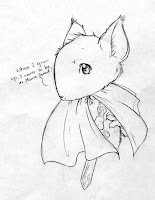 She drew Sadie knitting because she knew from Mouse Guard, that Sadie had spent a great deal of time alone at the outpost Frostic and that it would be a good hobby (shared by the artist). The last one, but certainly not least, was one I should have posted back after the super show. It's a sketch card by Lin Workman. The color is very vivid and I really appreciate that he took the time to do it as a surprise gift. Sorry to hear you got hit with an allergy while traveling. Hope you feel better soon. Are you coming to Montreal's WorldCon (August 6-10, 2009)? Hope you are feeling better. I used to have a similar reaction to guenia pigs. Bets wishes. Gah - I stopped by on Sunday afternoon and bought a sketchbook. I had no idea! Hope you're feeling better and that they figure out what caused it before it happens again. Ack! Sorry to hear that you had a reaction to something... but I'm glad that you were able to make it back to the con for a little bit and that you are feeling better now. Thank you so much for posting my sketch of Sadie knitting--sorry the signature was illegible! David, hope things are going well for you as of late. Sorry to hear of that allergic reaction you had. I remember doing all sorts of allergy testing as a kid...hundreds of needle prickings and such. Bah. Hopefully yours was much less? Take care! Geez, that's terrible... I hope you managed to figure out what caused the reaction. It's been a couple of weeks now, so I hope you've fully recovered. Take care! I'm looking forward to more Winter books! Wow Dave! Scary, I really hope yopu feel all better and get to the bottom of it. That happened to a friend of mine here about 6 months ago. Turned out to be lima beans of all things. 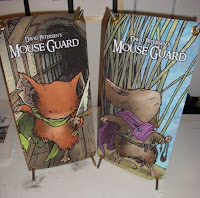 I am so impatient for the Winter mouseguard book!